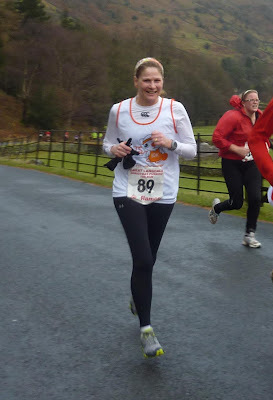 Today, Saturday the 15th December 2012 I took part in the Langdale 10K Christmas pudding race. The race started at 12 midday with a children’s fun run at 11am. I was running this race as my contribution to the 10K CATS Challenge. The CATS 10K Challenge is an event to help raise awareness of Tay-Sachs and to raise money to help in the fight against the disease. The idea is to get someone different to run 10km every single day for a year. The CATS 10K Challenge began on the 27th July 2012 and will end 27th July 2013. Tay-Sachs disease is a rare and usually fatal genetic disorder that causes progressive damage to the nervous system. I felt it was an excellent cause to run for and to try and raise a little bit of money to help. I was getting a lift to the race with a couple of friends Sharon and Nigel. Langdale is approximately 18 miles from where we live in Kendal and I was picked up at 10.30am just as the heavens opened! I had been stressing all morning about what to wear – its getting the balance right between being too hot and freezing! I opted for a short sleeved t shirt with the CATS 10K challenge vest on top, along with full length running tights. I wasn’t totally convinced this was the right combination so took a long sleeve running top with me – just in case! Just as we arrived the rain stopped and I was beginning to feel a bit more positive. Unfortunately, due to all the heavy rain the field which is usually open for competitors to park in for free was too muddy and water logged so the only option was to pay £4 to park in the one and only local car park! We got parked in what was probably the last available space (phew) and got out the car to go for the usual pre-race toilet stop. Although at this point I was still wearing my hoodie and rain jacket I was alarmed at how cold it was. We made our way to the pub, not for a swift pint but to visit the loo’s! I think the pub staff were trying to fox us non drink buying toilet using runners as when we got to the toilets and opened the door it was pitch black! We fondled the walls for a light switch and wafted the air for a pull cord but couldn’t find any form of switch! I pulled out my mobile and using the light from this we had a closer look – nope definitely no switch! So I had to pee in the dark by the light of my phone! Note to self – download a torch app for similar future scenarios!! After peeing in the dark we made our way back to the car to dispense of our many additional layers. After removing these and shivering in the cold I made the decision to change my top from a T shirt to a long sleeved one. I stripped my tops off in the back of the car, and put my “emergency” long one on. Once dressed i jumped out the car and glanced to my left – in the car next to me there was 4 lads!! I’m sure they weren’t very impressed with a middle aged woman stripping off to her bra infront of them!!! Hey ho maybe I should have looked around me first! Anyhow, feeling ever so slightly warmer now (wore my gloves too) we made our way to the start line. The run was starting at 12 and at 11.55am the rain started – not just a shower but torrential with what felt like sleet mixed in! I cowered between tall people in the masses trying in vain to keep warm and dry. There was lots of friendly banter about how barking we all must be! At 12 O Clock we were off – I didn’t hear any klaxon or starting pistol but the people in front of me moved so I assumed we had started! The start was fairly slow and was badly congested but it soon thinned out so I could get a pace going. Due to the high number of runners packed on the narrow country roads I lost Sharon and Nigel from the start. Sharon is usually a faster runner than me and I wanted to use her as a pacer to get a PB, but I was on my own. As well as dodging people I had to dodge huge puddles forming in the road too! The rain started to subside thankfully and at one point the sun was threatening to break through the black clouds. The course was a constant rollercoaster of ups and downs but I managed to maintain a constant pace. The race was a there and back route and as I hit the 2 mile mark I passed the first runner on his return! At the 3 mile mark there was water served in plastic cups which I decided to pass on (I was wet enough without spilling water down my front too!) and jelly babies! The hills on the return route seemed to have grown and i was beginning to tire. It didn’t help that the rain decided to start again around this point in the run! I kept an eye on my watch and I could see I was dangerously close to my PB time which I was determined to beat! I tried to put a bit more effort in on the down hills to make up for time lost going up them! At 5 miles I saw a friend with her children taking “action” photo shots which spurred me on to the finish! The finish was through a very wet, muddy and slippery field which prevented me doing a sprint finish – haha! All in all I was pleased with my run considering the awful weather conditions and was delighted to finish! I wandered into the finishing tent to collect my “finishers” Christmas pudding (would have preferred bling!) and a mince pie and had a swift look for Sharon and Nigel. After not seeing either of them I went to the finish line just in time to cheer Sharon through! By now I was very wet and very cold! Once we had cheered Nigel though the finish we went back to the car to get changed into dry clothes (this time I scanned the cars close by before stripping off!) and headed to the bar! My garmin time was 52:36, which is 2 minutes 10 seconds faster than my last Langdale 10K race and a PB! Just waiting for the official results to be published to confirm my time. Unfortunately this isn’t a chipped event so it depends where you start on the field to your time! This was my last run of the 2012 season – now to plan 2013! UPDATE: The results have now been published and my official gun time is: 53:14. Still a PB so still a happy bunny especially as I was 42nd female overall out of 176 female runners, 179th out of 408 total number of runners and 3rd female in the over 45 female catergory! You can see the full set of results here for the race. This is a fairly hilly course which can be viewed here!